Excellent cooking oil– Since ghee doesn’t start smoking until it’s heated to 375 degrees Fahrenheit, it will neither burn nor splatter easily. Its chemical structure also remains more stable than other oils when heated. Stores well– Thanks to its low moisture content, ghee can go weeks without refrigeration. It can last up to six months in the fridge or one year in the freezer, according to the Ayurvedic Institute. The key to ghee longevity: store it somewhere cool, keep it covered, and make sure it doesn’t get contaminated by other liquids – don’t double dip! Flavorful– Thanks to its strong flavor, not much ghee needs to be added to a dish to make it sing. Easily digestible– The process of cooking off milk solids from butter burns off its lactose and cholesterol (says Holistic Chef Shani Cranston of hOMe Grown Living Foods). This makes it much easier to digest than butter or vegetable oils. Anti-inflammatory– According to the Sushruta Samhita, a text of the ancient Indian healing system of Ayurveda, ghee is the ultimate anti-inflammatory food. Whole body healing– Ayurvedic practitioners use the golden elixir for everything from rejuvenating skin to aiding digestion to balancing hormones. Flexibility– Dr. Vasant Lad, founder and director of the Ayurvedic Institute, explains ghee’s popularity among yogis by stating that it lubricates connective tissues and makes the body more flexible. Enhances your essence– As reported by Paul Pitchford in Healing with Whole Foods: Asian Traditions and Modern Nutrition, ghee boosts ojas, the underlying essence of body issues; this leads to an increased immune system and greater longevity. Increases agni– In Ayurveda, proper digestion revolves around agni, the body’s digestive fire. Consuming ghee boosts one’s agni, leading to better digestion and faster metabolism. 1. Melt 1 pound of unsalted butter in a heavy saucepan over medium heat. Add 3 or 4 cloves if you wish. This will aid in the clarification and lend a delicate flavor. 2. As soon as the butter begins to boil and foam, reduce the heat to a simmer. 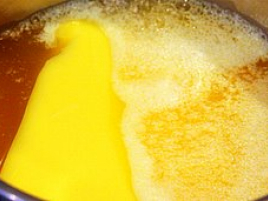 Keep the melted butter at a steady simmer until it is golden in color and no foam remains on top. 3. When the crackling sound stops, the ghee is ready. 4. Cool the mixture and strain it into a sterile quart jar. Discard the curds from the bottom, as they are almost pure cholesterol. About the author: Kiva Bottero works with a collective to publish The Mindful Word journal of engaged living (www.themindfulword.org). He also writes and edits for Dew Media, a company that specializes in providing custom publishing services for non-profits and social enterprises (www.dewmedia.org), as well as various magazines and blogs, such as Cleantech Authority(www.cleantechauthority.com).